One of the advantages of the Delta Plan was to have been the creation of vast freshwater reservoirs. Those protesting about this very phenomenon claimed that such total enclosure would threaten the existence of a unique salt-water environment and its attendant mussel and oyster farms. 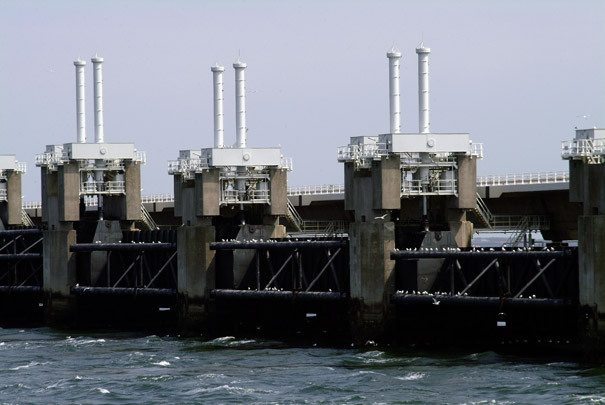 However, by introducing enormous flood gates which are to be closed only in extreme circumstances, tides continue to ebb and flow and the salt-water environment remains unimpaired. The structure consists of 66 colossal concrete piers in-between which steel curtains can be lowered hydraulically.